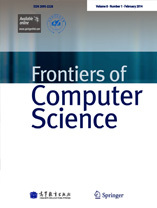 On March 18, 2014, Prof. Christoph Meinel, a member of Acatech, the German National Academy of Science and Engineering, was appointed as an editorial board member of Frontiers of Computer Science. Held in New Main Building of Beihang University, the appointment ceremony was attended by Academician Wei Li (FCS Editor-in-chief), Prof. Zhang Xiong (FCS Executive Editor-in-chief), Dr. Feng Cheng (University of Potsdam, Germany), FCS Young AE Dr. Junjie Peng (Shanghai University), as well as teachers and students from School of Computer Science and Engineering and School of Software, Beihang University. During the ceremony, Prof. Wei Li awarded Prof. Christoph Meinel the Letter of Appointment and invited him to give a presentation named “Challenges and State-of-the-Art of MOOCs”. In his presentation, Prof. Meinel analyzed innovation of MOOCs compared to traditional university education and online courses, and also made an introduction to the status quo of MOOCs in University of Potsdam as well as in Germany. The participants had an energetic discussion with Professor Meinel on issues such as industrial prospect, courses diversity and intellectual property. As an international academic journal co-managed by Beihang University and Higher Education Press, FCS has been successfully selected into the “International Influence Promotion Project for Journals of Science and Technology in China”. At present, FCS is indexed by SCI, EI etc. Prof. Christoph Meinel is a German scientist and university professor of computer sciences. He is president and CEO of the HPI for IT Systems Engineering at the University of Potsdam, and a professor for Internet Technologies and Systems. He is a member of Acatech, the German National Academy of Science and Engineering, and also the chairman of the national German IPv6 council. With abundant research and educational experience in computer science, Professor Meinel will definitely make a great contribution to promoting the international influence of FCS.